The heat is on in this fast paced action-comedy starring Eddie Murphy as Axel Foley, a street smart Detroit cop tracking down his best friend's killer in Beverly Hills. Axel quickly learns that his wild style doesn't fit in with the Beverly Hills Police Department, which assigns two officers (Judge Reinhold & John Ashton) to make sure things don't get out of hand. Dragging the stuffy detectives along for the ride, Axel smashes through a..
Beverly Hills Cop The heat is on in this fast paced action-comedy starring Eddie Murphy as Axel Foley, a street smart Detroit cop tracking down his best friend's killer in Beverly Hills. Axel quickly learns that his wild style doesn't fit in with the Beverly Hills Police Department, which assigns two officers (Judge Reinhold & John Ashton) to make sure things don't get out of hand. Dragging the stuffy detectives along for the ride, Axe.. The heat is on... ...In this fast paced action-comedy starring Eddie Murphy as Axel Foley, a street smart Detroit cop tracing down his best friend's killer in Beverly Hills. Axel quickly learns that his wild style doesn't fit in with the Beverly Hills Police Department, which assigns two officers (Judge Reinhold & John Ashton) to make sure things don't get out of hand. Dragging the stuffy detectives along for the ride, Axel smashes thro..
Axel Foley (Eddie Murphy) journeys back to Beverly Hills for a real roller coaster thrill ride at the Wonderworld amusement park! Joined by old pals Billy Rosewood (Judge Reinhold) and Serge (Bronson Pinchot), Axel becomes the hottest new attraction as he chases down the bad guys on the rides, through the shows and in the underground maze beneath the park. Beverly Hills Cop III is a wild, funny action comedy that will have you hooked fo..
Axel Foley (Eddie Murphy) journeys back to Beverly Hills for a real roller coaster thrill ride at the Wonderworld amusement park! Joined by old pals Billy Rosewood (Judge Reinhold) and Serge (Bronson Pinchot), Axel becomes the hottest new attraction as he chases down the bad guys on the rides, through the shows and in the underground maze beneath the park. 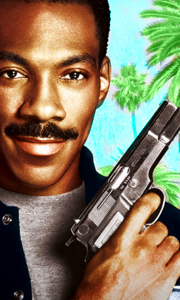 Beverly Hills Cop III is "a wild, funny action comedy" that will have you hooked .. The heat's back on! And Eddie Murphy is cool as ever in this sizzling, smash-hit sequel to Beverly Hills Cop. Axel Foley (Murphy) is back - back where he doesn't belong! He's going "deep, deep, deep undercover" into the chic wilds of Southern California, unleashing his arsenal of blazing gunfire and rapid-fire gags against a gang of international munitions smugglers. Back, too, are Judge Reinhold and John Ashton as Murphy's crime-bustin..